Before the last Chinese dynasty ended the expression of crafts and arts followed mostly tradition and was limited to some degree by imperial guidelines and other factors. One of the latter were possibly the methods with which arts and crafts were taught in Far Eastern societies in ancient times, not allowing for free expression and creativity. Apprentices would rather be copying the works of their master or others rather than creating their own works. Only from the republic period onwards, after the old ways declined, artistic expression became possible, and shapes and decorations slowly became more variegated. A major cause of this was possibly the increased exposure to foreign cultures. Accordingly, the 20th century became for ceramics a new era of innovation, with new shapes and decorations. Potters and factories started producing items that were more and more different from the traditional wares, incorporating creative influences from abroad. Identifying Chinese porcelain involves more than just knowing the mark in order to decide age and manufacturer, as many novices do believe. See a comparison of Chinese and non-Chinese marks. The identification and authentication of Chinese porcelain is a complex process of an overall verification of a number of factors. 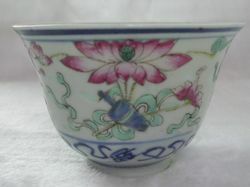 All experienced collectors know that with Chinese porcelain the mark is the last to be looked at. Identifying Chinese porcelain items, including evaluation of age and/or manufacturing period, always involves, among other, shape, decoration and other reference points. These are important for further evaluation, once an item is established a genuine antique. Since porcelain was first produced, assumedly in the Song dynasty, its forms were limited to certain shapes. Although shapes may have had some minor variations during different dynasties or reigns, deviations within a single reign or dynasty were usually relatively limited. This is one of the factors which helps us identify Chinese porcelain. The shapes usually remained more or less the same with kitchen or table wares due to their utilitarian purpose and association with our eating and drinking habits. Decorative items like vases, jars and ceramic containers of all sizes and forms were more subjected to change. When visually identifying Chinese porcelain, the Shape is the first thing meeting the eye. A short glance over a vase or jar, for example, often allows an expert of Chinese ceramics to assert or discard the possibility of a Chinese object being antique. Some shapes or curves, like those found in Japanese Sake jars or tea cups, are rare or non-existent among Chinese ceramics of old, yet they can be found on modern fakes. Another example is the Europen plate shape, which was virtually unknown in China before production for European clients started, in the 16th and 17th centuries. If the shape passes this first step of inspection, the expert will most likely do a short evaluation of the decoration's color(s). Here again, certain colors (pigments) or combinations of these were not available in earlier times, or were out of supply at times, due to trading prohibitions during certain periods. Therefore, the presence of a color or colors that will not fit a specific period of production, will result in an item being classified as a later reproduction or fake. The very earliest porcelain decorations of porcelain were made in blue on white ground. But, even the blue color tone differed depending on whether the blue dye was imported, sourced domestically, or was a mix of both. As imports weren't available at all times, this color itself may also help identification of Chinese antiques. See antique china categories for color information according to decoration type. If the item passes color inspection, then the decoration will probably be scanned for any signs of acceptable or unacceptable styles or patterns. Different painting styles may also give some era-specific hints. Looking at the bottom of an item provides the most relevant indications in view to age and/or approximate time of production. The production process was subject to a continuous improvement over the centuries. The presence or absence of signs or features pointing to certain techniques can be an important means to clarify authenticity of porcelain. The glaze provides some hints as to the age, as it was different and evolving over time, and may have been subjected to elements (soil, sea, air). As with the glaze the clay/slip was gradually refined and in the 18th century its quality was at the peak. However, it declined somewhat after that. Some defects therefore may not show in porcelain of the 18th century. Finally, the whole item is checked for the appropriate age signs. Here again, some points involving the techniques (e.g. kiln firing, etc.) developed over time can be included in the overall evaluation when identifying Chinese porcelain. If there is a mark, the experienced collector will know if the period of the mark and that of the item itself (the points mentioned above) fit into the same picture. Please see the section on marks.